In Tampere, there are several platforms for open innovation co-operation between universities, companies and the city. Open innovation platforms are a key tool in the development of a smart city. Some of the open innovation platforms in Tampere have been operating for a long time now while some are only just in the start-up phase. Would you like to identify opportunities offered by innovation platforms for your company? Please find out more information. Innovation platforms operate on the basis of open co-operation, which is implemented and facilitated between those operating in the public, private or third sectors in order to develop new products and services. Innovation platforms offer 1) companies the opportunity to develop and pilot new concepts, 2) students the chance to implement actual development projects with clients and 3) cities the possibility to network with service developers. Campus Arena is a work environment for universities and companies which supports a sense of community, learning and business. Business support services as well as top laboratories and international research groups are directly available. Students provide a motivated workforce, new viewpoints and strong enthusiasm. The facilities and services have been tuned to support smooth and productive co-operation. Campus Arena is particularly suitable for research-intensive companies as well as the developers of new technologies, services and products. Campus Arena is located at the Hervanta campus. The Tampere health care cluster is located at the Kauppi campus. Medical research, treatment and exercise connect around the university hospital, faculty of medicine and FinnMedi Oy. Located at the Kauppi campus, HealthHUB brings together companies and operators oriented towards health, well-being, health technology and research. BioMeditech is a multidisciplinary joint institute of Tampere University of Technology and the University of Tampere for life sciences and medical technology. The institute offers a multidisciplinary research environment as well as support for new innovations and business. Creative industries and ICT meet in Tohloppi, at Mediapolis. More than 30 companies and organisations are already active at the Mediapolis campus. Three educational institutions operate at Mediapolis: Tampere University of Applied Sciences (TAMK), Tampere Vocational College (Tredu) and the University of Tampere. Those operating at Mediapolis also have connections to Tampere University of Technology. Between the educational institutions and especially the universities, there is a mutual interest for research activities and projects aiming at genuine innovations that generate business. TreStart is a networking place and a professionally implemented innovation platform where experienced job-seekers with (multisectoral) expertise as well as companies in the Tampere region work in close co-operation in order to create new jobs. The foundation of a business-oriented innovation platform is usually a need, the participants’ common interests to solve that need and the participants’ complementary fields of expertise. The purpose is to develop business through a shared platform approach. The mutual need may be associated with, for example, participation in pre-commercial tendering or research and product development co-operation. Universities and municipalities, for example, may be involved in these activities. Business-oriented innovation platforms can operate in a shared physical space and/or using digital solutions. Business-oriented platforms in the Tampere region include ITS-Factory, Smacc and Valomo Cooperative. An innovation in itself, New Factory is an open innovation environment originating from the ICT and media sectors. 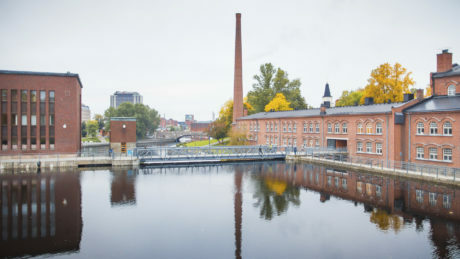 New Factory operates in Tampere city centre, in the Finlayson area. Innovations and start-ups emerge at New Factory as international student teams look for new solutions for the needs of companies and communities. The New Factory start-up programme is a free 3-month programme which helps growth-oriented teams and companies clarify their business model. At New Factory’s Demola, students and researchers develop demo products and services with and for companies. Potential growth companies are coached and stimulated at Accelerator. For start up companies in the media field, there’s Mediapolis Accelerator programme run by Digital Media Finland. In the case of campus platforms, activities are strongly linked with promoting entrepreneurship, entrepreneurship studies and start-up activities. A variety of services and processes are used to promote the co-operation and joint innovation of start-up companies, students, researchers and different stakeholders operating on the campus platforms as well as companies operating elsewhere, with the aim of launching the commercialisation process of new innovations. The goal at the campus platforms is to develop the facilities of educational institutions into operating environments which are more innovation platform-like. Campus platforms operating in the Tampere region include TAKK/Hiomo, TAMK/Y-campus, TREDU/Ylötehdas and TUT/Talli. 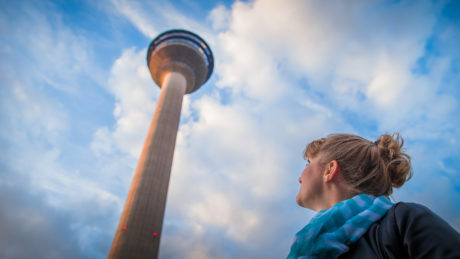 In Tampere, tradition is particularly related to change; the city and its industries are proof of a continuous tradition of innovation throughout its history of more than two hundred years.